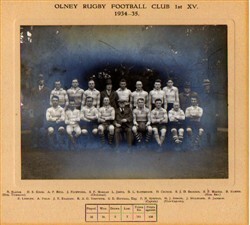 Olney RFC 1st XV, black and white team line-up photograph with names of players and officials and a table of matches and points, season 1934-35. Back row: R. Slater (Honorary Treasurer), H.S. Good, A.P. Bell, J. Packwood, S.F. Morgan (Chairman), L. Jones, R.L. Sandbrook, D. Crouch, S.J.D. Skinner, S.F. Martin (Honorary Secretary), B. Harris. Front row : F. Lindley, A. Field, J.T. Bradley, R.A.C. Tompkins, S.E. Hipwell, Esq., P.N. Sowman (Captain), H.J. Simcoe (Vice Captain), J. Millward, F. Jackson.